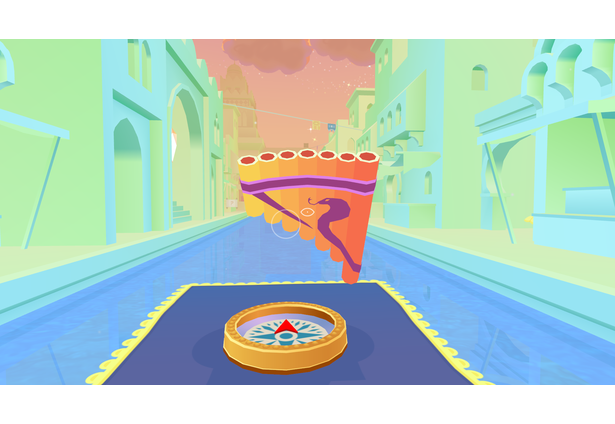 Navigate by constellation as you fly on a magic carpet through the mystical land of Bazaar, collecting exotic curios and crafting instruments to aid your journey. 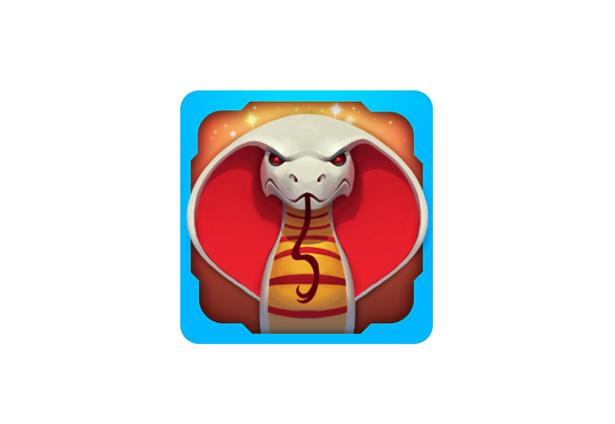 Puzzle your way through the districts to unlock their treasures and discover the key to the heart of the city. Bottles and lanterns and optical devices litter the streets of the glass blowers district, but many are trapped behind stained glass. Can you unlock a way to see through? Wind your way through the laundry lined passages of the textile district and you’ll find a path blocked. Can you find a way through? They key is to look to the stars. 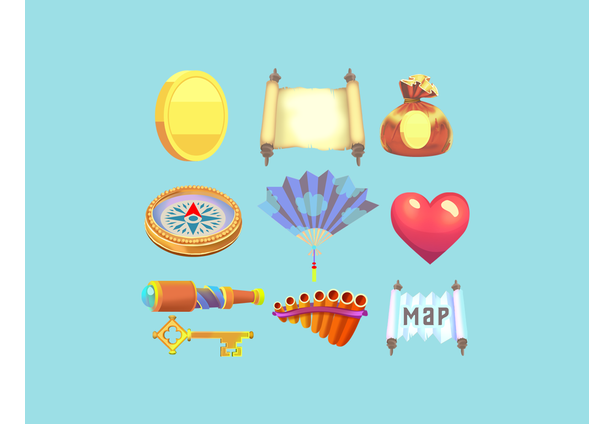 The core of the game is a treasure hunting game, collecting patterns of treasures to satisfy the bounty demands through the city, reaping rewards that can be pocketed for future use. As tranquil as this journey is, beware. 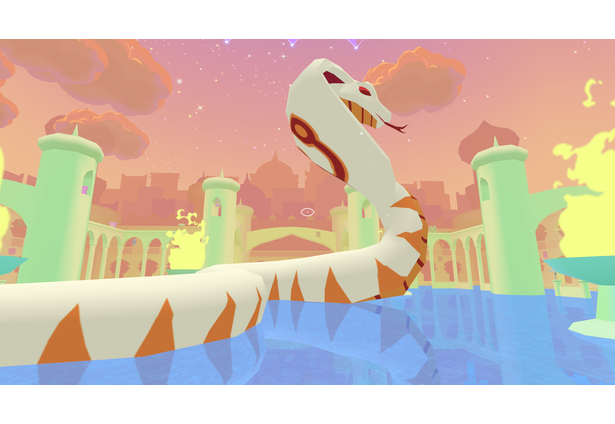 Sea cobras lurk along the open aqueducts of the city, and something sinister lies in wait through the palace doors. 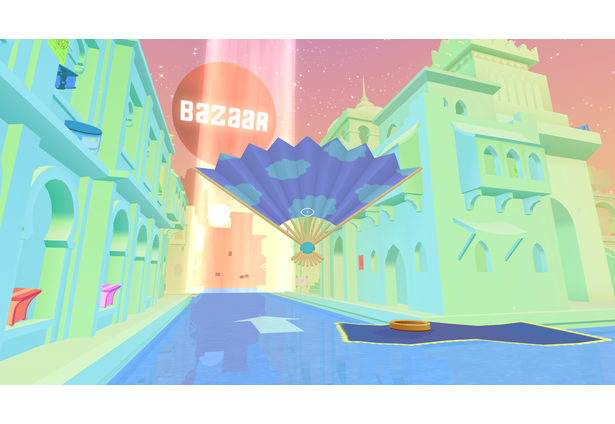 You’ll have to use the skills and instruments you’ve built exploring the city to prevail in the final test of Bazaar. Inspired by trips to flea markets and thrift stores and a particular Turkish lantern shop in Carmel, we wanted to make a world full of colorful curiosities. Everyone on our team likes color so we just went for it and developed a blackless palette to keep things vivid and surreal. 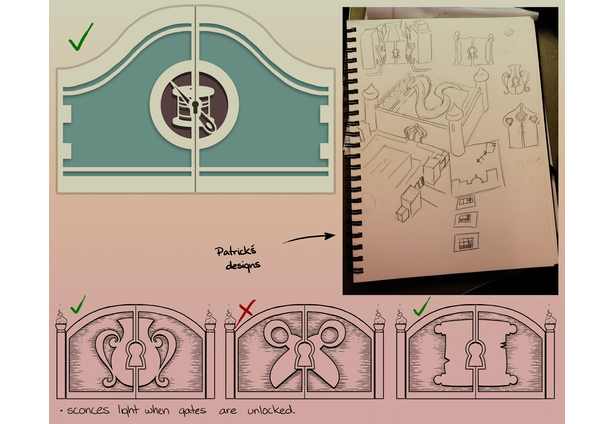 We had a lot of fun developing controls for the VR to help retain immersion and explore novel UI solutions. In early iterations of the game we found ourselves gazing skyward, so we built an inventory system around constellations. 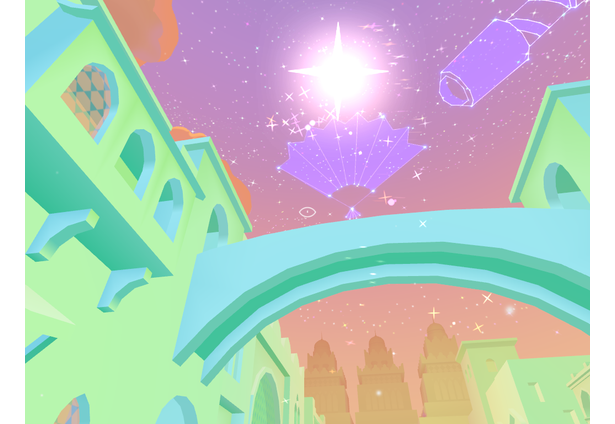 To draw the connection for the player between acquired items and their star inventory, we guide their gaze up with a shooting star. If they look away, the star will freeze and hover mid-path. 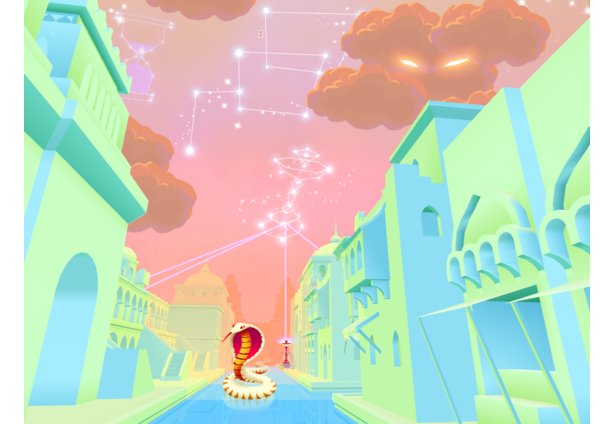 Its trajectory completes when under the player’s gaze again. This resolves early iteration issues where playtesters were oblivious to additions to their constellation pool. 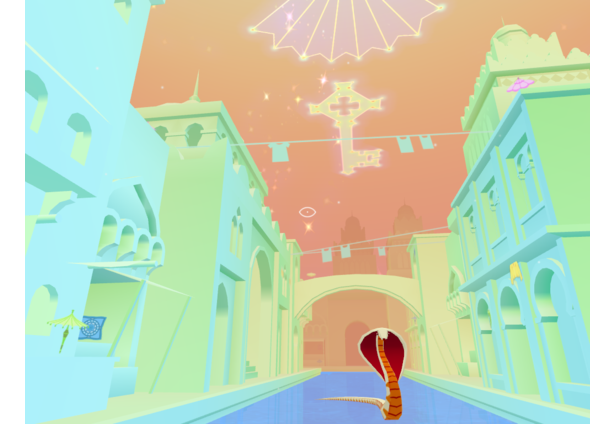 From the sky, players can activate instruments, see their minimap, detect hazards and enemies, and keep track of health. One of the cool instruments in the game is a magic scope. 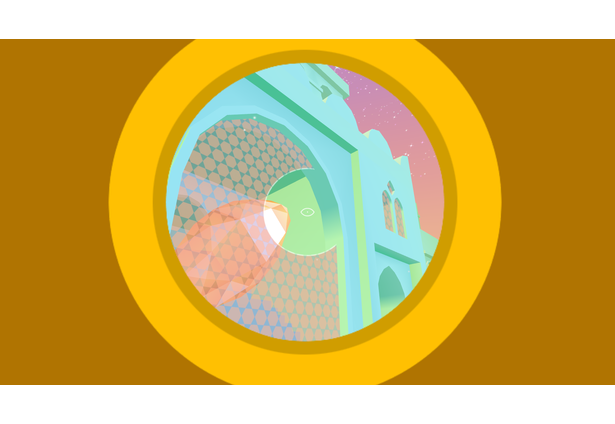 This telescope can be used to peer through colored glass to detect and collect items on the other side. We display the telescopic circle FOV to the right eye, and a blank black screen to the left. 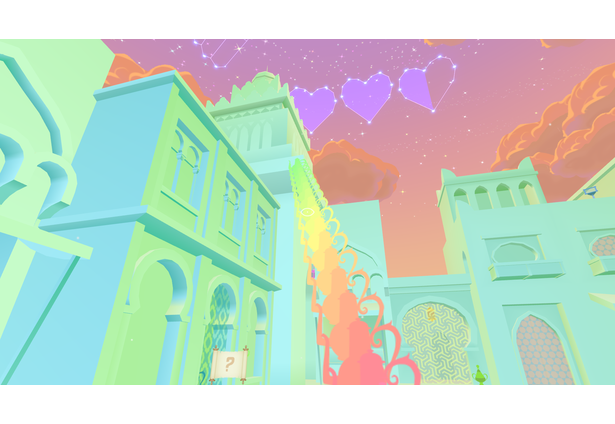 Players naturally shut the left eye which is a pretty fun way to simulate using a telescope in VR! We also developed a novel “nod gesture” to allow players to pace their tutorials. We found getting the player to look in the direction of their movement through turns helps to reduce motion sickness, so we came up with some tricks to incentivize this behavior. For example we tuned when a player can register an upcoming turn. We also found we can accelerate the player linearly through the labyrinth as long as they are looking in the direction of travel. We use this in compass mode, when players can control their speed. Everything in this game was made exclusively for this jam! 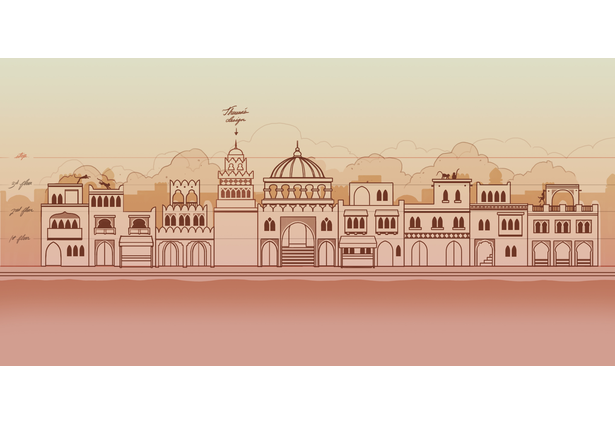 We started with our own custom mostly-2D game engine. 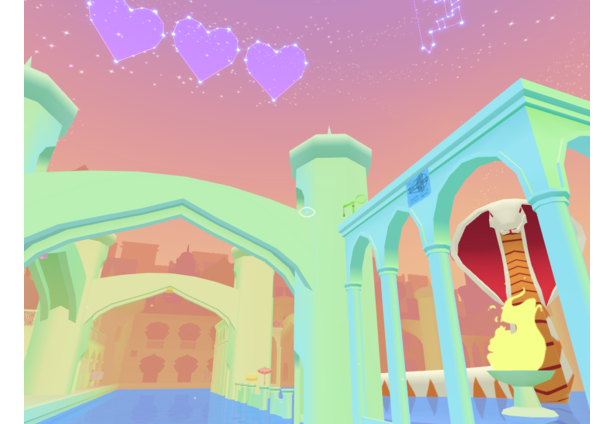 We added many systems including VR rendering, skinned animations, android drivers, 3D sound, and a 3D asset pipeline. 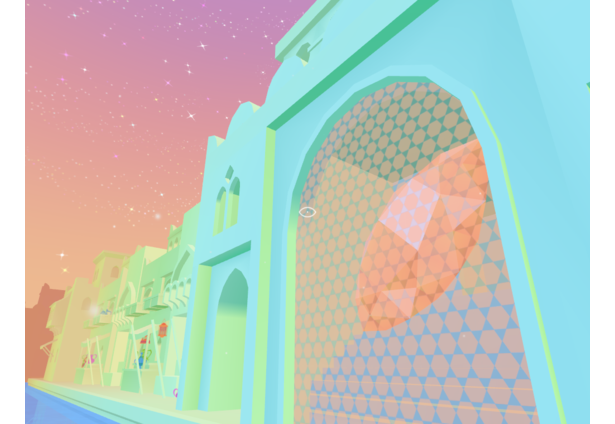 Although the off the shelf game engines are great, we enjoy the control we get from a using our own engine and we experimented with many things like crazy sorting and custom shaders. For performance, we experimented with a custom renderer that draws far away objects monoscopically and close by objects in stereo. We develop the performance tools we need like our in-game profiler. But mostly we are just code nuts and like writing game engines! We’re a ragtag gang of indies who joined forces to jam on this project together. 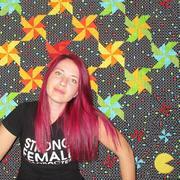 Theresa Duringer - Just shipped Cannon Brawl. What am I doing with my life next? VR GAME JAM that’s what! 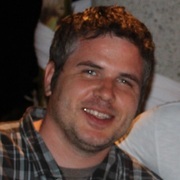 Jeff Gates - FULL STACK refers to pancakes right? Ben Rosaschi - You want me to draw HOW MANY trinkets? nice palette! looking forward to this. Thanks Mike. We went with a blackless palette after an inspiring trip to the impressionist exhibit at the de Young museum in San Francisco. Polyfauna looks pretty as well. Looks like you're a color geek too. 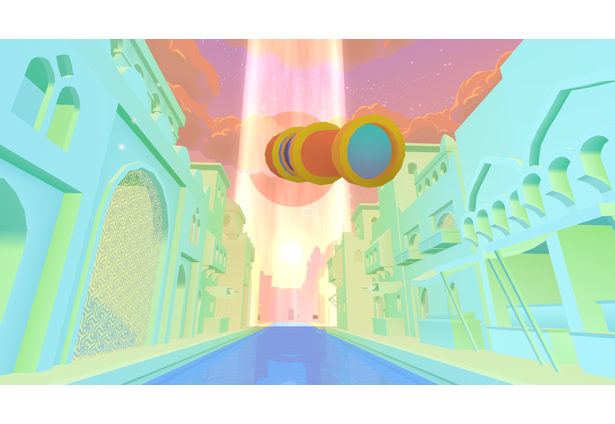 Love the art design and use of shaders. This looks awesome! Love the style and vibe! Looks really cool. I'd love to fly around in that colorful world. I need this in my life as soon as possible. 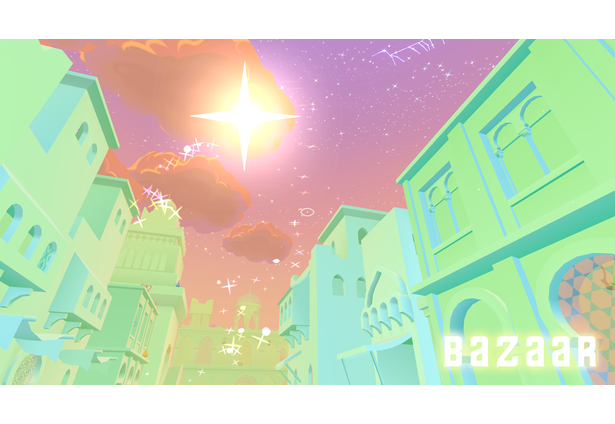 That's gotta be really fun to fly through Bazaar... with the buildings relatively close & the constellations so far away, that must do a great job of helping you really feel the depth with VR. Jay, yeah I did a demo last night and a lot of people gave similar feedback on nodding, so Tod's going to jump on that to improve it. 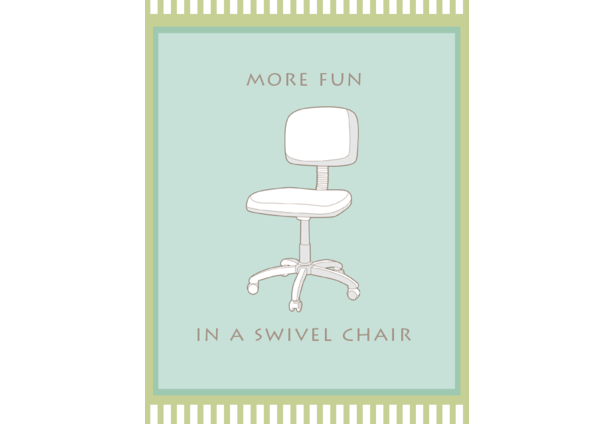 Also we tend to develop and play in swivel chairs, which makes turning way more enjoyable. I'm going to try tutorializing that a little bit to let people know how to have the best experience. I hope to have the updates based on your notes in the playable build soon. Thank you for the comments and thanks for taking the time to help us improve it! Very colorful and interesting aesthetic. It looks like it has great atmosphere and moments of exploration. 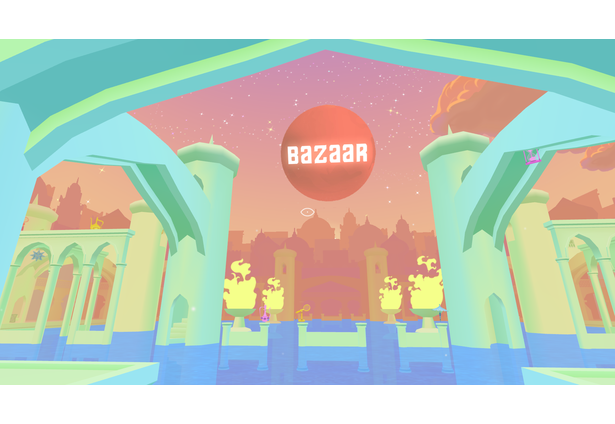 The idea of collecting items in the Bazaar brings me back to my Swap-meet/Flee-market shopping sprees. I wish wall-mart was an open air market so I could be guided through on my Black Friday journey! I can't wait to try. Thanks Dmitry! Credit where due, our music is by Josquin des Pres, he does some really creative stuff! I was checking out your Wendy project earlier, it has a lovely mood. Can't wait to play. Comments for this submission are closed. View the software in greysphere's portfolio to continue the conversation.